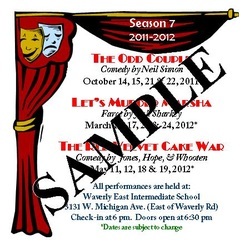 If you would like to order a Season Punch Pass by mail, please send the following information to Starlight Theatre, 225 Leland Place, Lansing, MI, 48917: Your Name, Address, City, Zip Code, Phone Number, Email Address, how many regular and how many student/senior passes you are purchasing and total amount enclosed. Your pass will be mailed to you within two weeks. Please make checks payable to Starlight Theatre. Call us at (517) 243-6040 if you would like to pay via Visa or MasterCard. You will need to provide the name on the card, the card number, the expiration date, the security code (last 3 digits on the back of the card), your house number and zip code. Season 9 Punch Passes are currently on sale until December 31, 2013. Gift Certificates are available for any performance and make a great gift! Pricing varies based on show and type of ticket. Please contact us for more information.